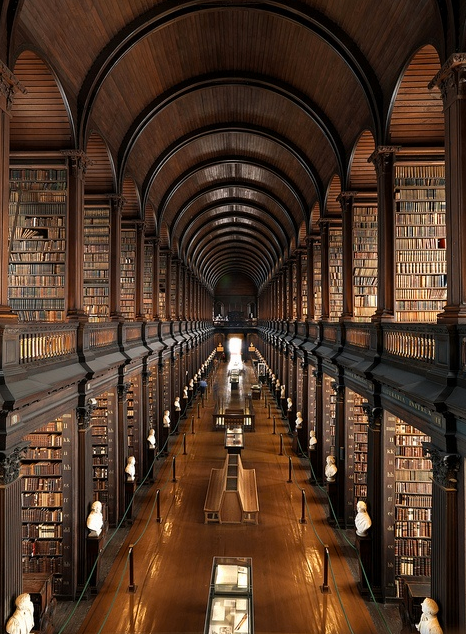 The Trinity College Library, located at Trinity College, Dublin, is the largest library in Ireland. As a "copyright library", it has legal deposit rights for material published in the Republic of Ireland; it is also the only Irish library to hold such rights for the United Kingdom. The library is also the permanent home to the famous Book of Kells. Two of the four volumes are on public display, one opened to a major decorated page and the other to a typical page of text. The volumes and pages shown are regularly changed. The current librarian, Robin Adams, is Chair of the Irish Universities Association Librarians' Group. Staff and students of the University of Dublin also have access to the libraries of Tallaght Hospital and the Irish School of Ecumenics, Milltown.